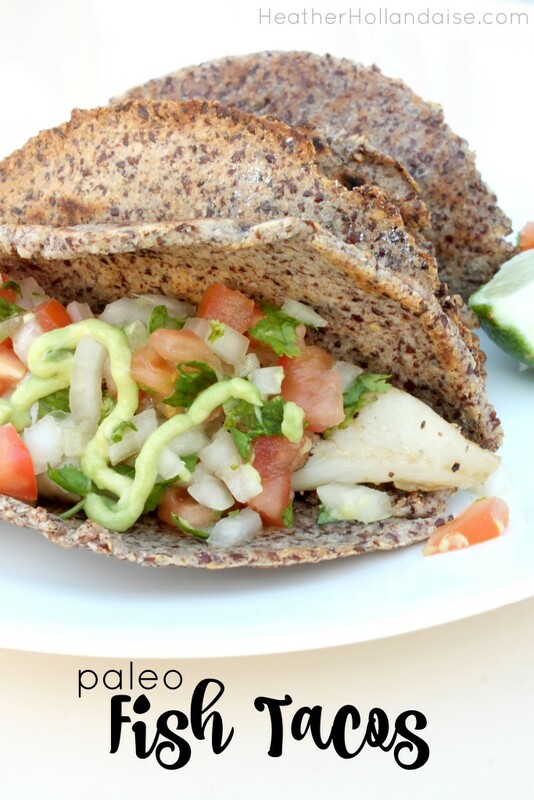 Tacos are one of the easiest dinners to throw together on a busy day. There are so many different versions to make, and my family loves them all! Normally I let the rest of the bunch go to town on the tortillas while i make myself a taco salad or lettuce wrap. 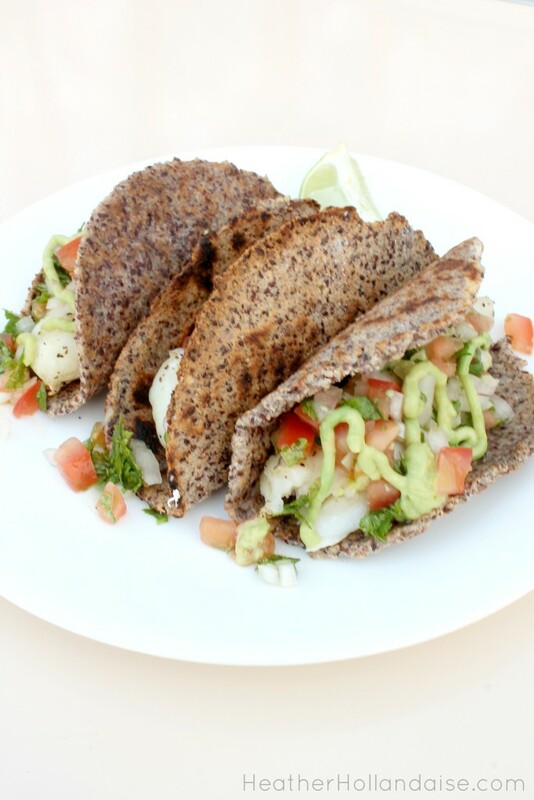 But when I was planning these fish tacos for dinner, I really had a hankering for a crispy crunchy taco shell. My original intentions were to serve these up for Taco Tuesday, but my husband surprised me and came home early so we could go pick up the wood to build our living room! My mother in law and I helped load up the trailer, so to thank us for our hard work he took us out to dinner at Olive Garden. That was certainly a treat. We don’t do fancy dining very often because of kids, food allergies, and tight budgets. And thanks to the gluten free options and bottomless salad, it was a meal I very much enjoyed. So yesterday we headed back out to pick up the rest of the materials for the house, and I made it back home just before sunset. If making your own taco shells sounds intimidating, let me tell you that I had this entire meal cooked, plated and photographed before the sun went down. All together it took me about an hour. The cooking itself only took 30 minutes! I love dishes with a variety of textures and different notes of flavor. 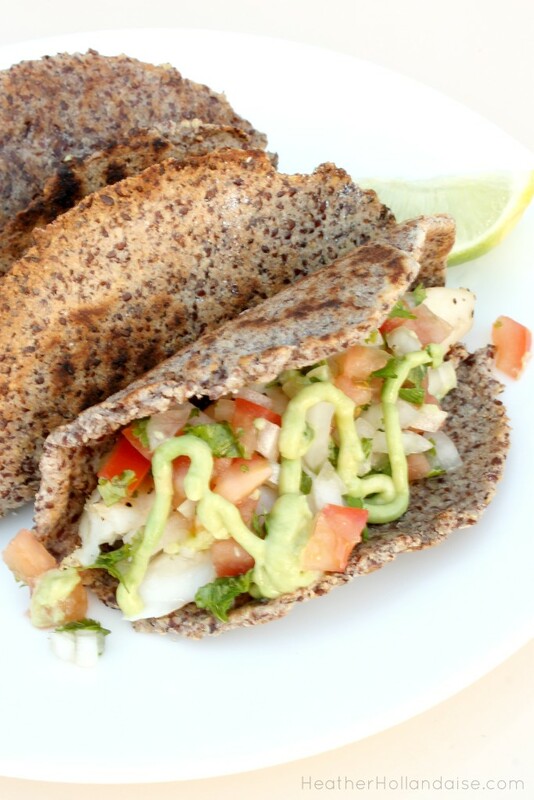 This combination of moist and flaky fish topped with fresh citrusy pico de gallo and creamy guacamole comes together perfectly served up in a savory hard taco shell. Now I can say adios to the lettuce wraps. I can toss those tortillas too. 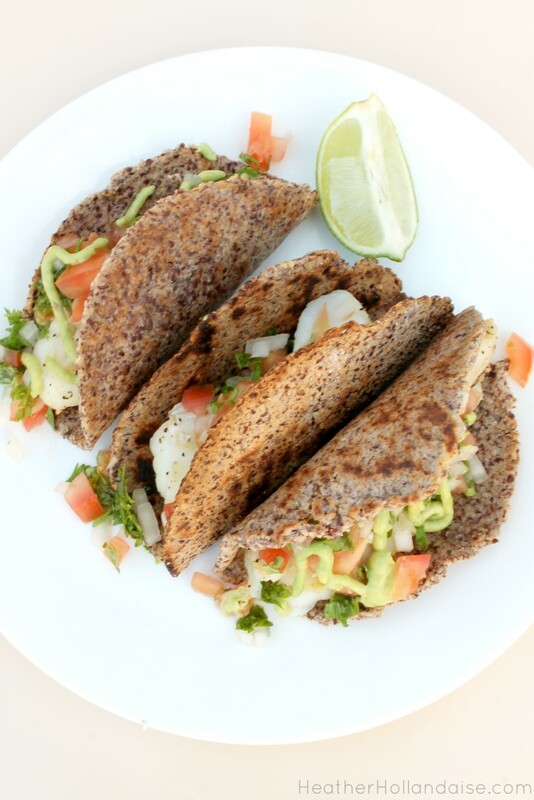 The whole family loved these healthy grain free tacos! Stir in water until mixed well. Heat a large non-stick skillet to medium-low. Place one piece of dough between two sheets of parchment and roll the dough thin, the size of a taco shell. You can use a bowl to cut the shape of circle if you desire. Carefully transfer the dough to the pan. Cook 4 minutes each side. Remove with a spatula, and slowly bend the taco and place in a wide cup to cool. This will help it retain its shape. To speed the process, I rolled my next piece of dough while the first was cooking and put it in the pan when i flipped the first one. Continue this until all the dough is cooked. add ingredients to a food processor and blend!